I love study Bibles. My favorites are those you create yourself. The best way to create your own study Bible is with a wide margin Bible. 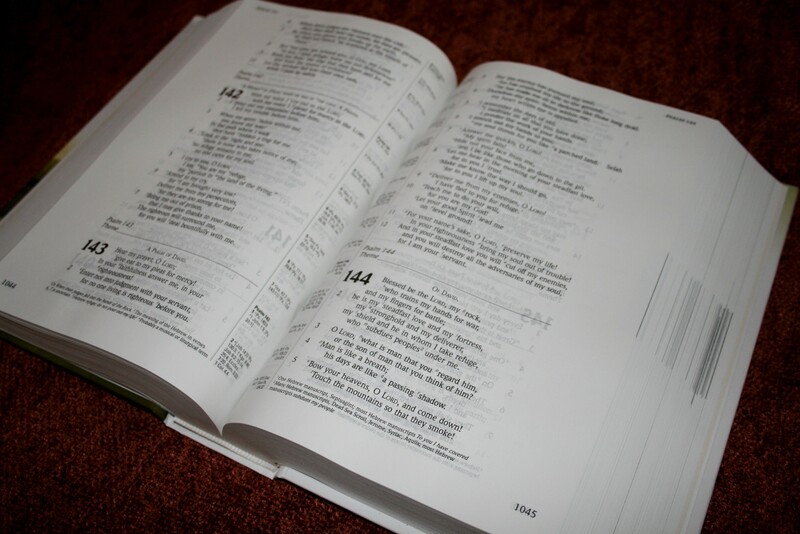 I call a wide margin Bible an instant study Bible… just add study. The best thing you can do for your personal study of God’s Word is to buy yourself a wide margin Bible and use it like your life depends on it. 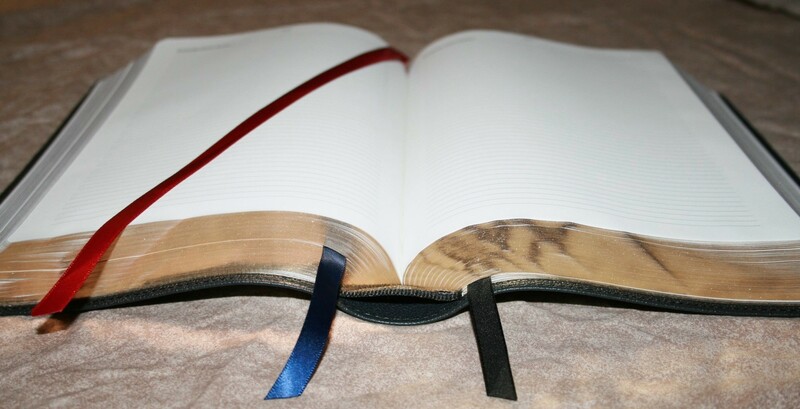 No Bible looks better than one you love using. What is better than spending your time in God’s Word? A wide margin Bible is an investment. It’s been said that wide margin Bibles are the “thinking man’s Bible”. This is true. It’s also been said that making your own notes improves recollection and comprehension. I know this is true for me. I learn the text and remember it better when I interact with it. People usually try to deter me from using a wide margin Bible by saying things like “it will take a long time” or “it will be hard to do.” My answer to that is yes. Yes it will. And it’s worth every minute of it. Set aside things that don’t matter and spend your time getting to know the Word of God. – Do you have any to add? Let us know in the comments! Taking notes helps you to create your own connections with the text. It helps you to make your own observations and gives you a deeper understanding of what the text is saying. It helps you to create your own system of references which connects thoughts together and allows Scripture to interpret Scripture. You can see applications, create your own devotionals, and decide what tools you need. You’ll be an active student of the Scriptures. There are several good tools for writing notes in your margins. Here are the tools that I personally use and recommend. Pigma Micron markers are my favorite for writing notes. I used these in my Concord wide margin. I use different colors to represent different things. Brown is a great choice for notes because it’s dark enough to see but doesn’t show through as bad as black. 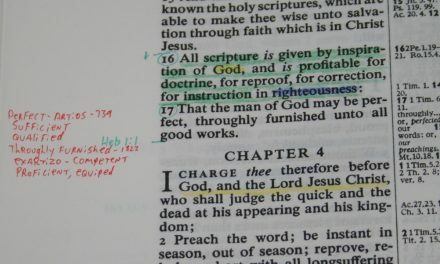 In my old Concord I use red for definitions, blue for section summaries (these help for find the context quickly, which helps in searching and preaching), black for chain references and their topics, and green for topical studies. 05 are typically used for underlining and 01 are used for notes. The smaller the number the thinner the line and the less ink is placed onto the page. This allows you to write smaller and have less bleed-through. Mechanical pencils work fine, but some are better than others. I use one in my journaling Bible and my Cambridge NKJV. I prefer .5mm. I write small and lightly. I’ve always written small and, although it is harder to see for preaching, it gives me more room for notes. One advantage of pencil is you can erase it. One problem with pencil is it can smudge if your fingers touch it. Another problem is all of your notes are the same color. You could get a mechanical pencil with different colors but these are better for highlighting than writing notes. I recommend placing cardboard with lines drawn on it under the page you’re writing on. This will help you write straight and will help keep you from making scratchy marks in the pages under the page you’re writing on. Highlighters and color pencils are great for marking the text. 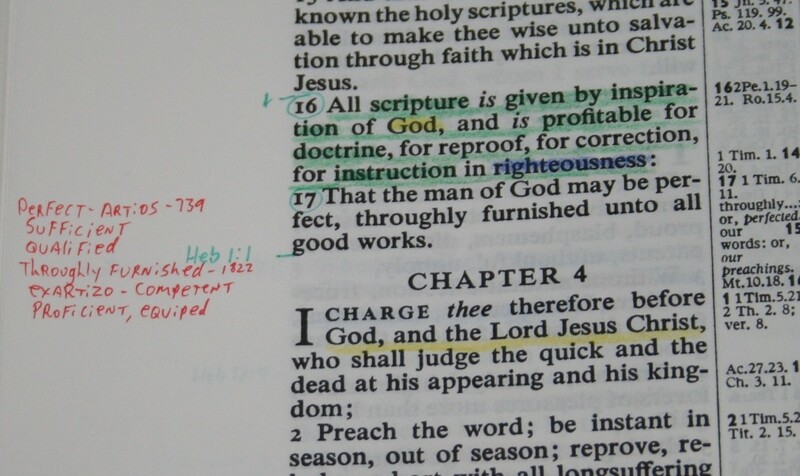 You could draw colored boxes around your notes to indicate something specific such as a topic or type of verse. PrismaColor and Crayola make good color pencils. Zebrites are popular highlighters for Bible marking. Writing tip – for writing in the first or last few books of the Bible, it can be difficult to get the cover to lay in a good position to allow you to write on a flat surface. Use a book or the box your Bible came in to place under the cover to get rid of any awkward bends in the text-block and you’ll have better access to the inner margins. My favorite tool for creating your own study Bible is a wide margin Bible. Many people have an aversion to writing in a Bible, but wide margin Bibles (as well as journaling Bibles) were made specifically for that purpose. You can get them as text only or as complete reference editions. Some have paper in the back for writing. What you need depends on how you plan to use it. If it will be your primary Bible then I recommend a reference edition. There are two basic layouts: wide margins in both the inner and outer margins, and wide margins only in the outer margins. The last one works better for single-column editions. Wide outer margins are far easier to write in. There are others that have two columns of text but only have a wide margin on the outer margin. These have less space for notes but it does help keep the overall book-block smaller. Another option, although not as common, is interleaf. These have a blank page between every page of text. Most of these layouts have wide footers so you can write notes on the bottom of the page. This is a good area to create timelines, chain studies, add definitions, write outlines, write notes for the center column if it’s too small, or write notes when you run out of room in the margins. The text is presented in either verse-by-verse or paragraph. I prefer paragraph for reading, but verse-by-verse works better for me for adding notes next to the verses. It also gives more space per verse. Narrow columns also tend to give more space because it uses more lines for a verse. I recommend a Bible that has 6” wide margins, large print, and fits into your pocket. If you find one of those then please let me know. In the meantime I have to settle for a large Bible with 1-1.25” margins and small print. Or, a smaller Bible with even smaller print. You can get a large font, but you have to trade something for it. You can even get a smallish Bible… but you still have to trade something for it. Usually, larger fonts require large Bibles and no other tools. If you want lots of writing room and luxuries like cross references, you’ll trade in your large fonts for small fonts and you’ll have a large Bible. You have to decide what you really need and what you’re willing to trade for it. Of course you don’t have to settle for just one… If it’s within your means then I recommend one with all the bells and whistles and one that’s nothing but the text. This would give you a variety of text-block sizes to work with and you can use them for different occasions. I highly recommend buying the best you can afford. The better the quality the longer it will last. This will be a Bible that you use a LOT. For best results you should use it every day. It will take a lot of time to get your notes in those margins. 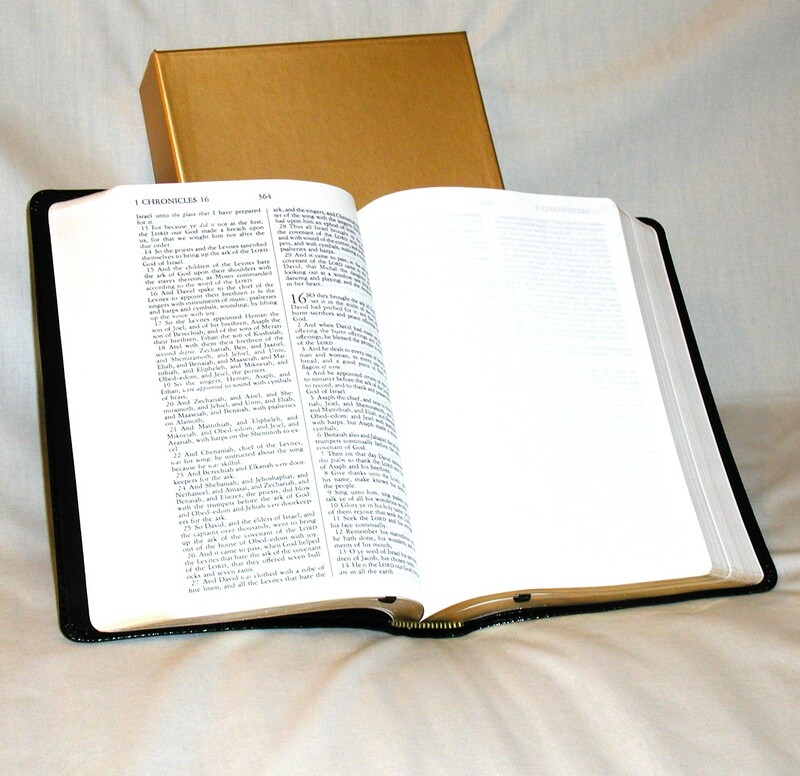 This Bible will need to stand up to daily use and for anything else you use it for (carry, study, preaching, etc.). It’s also something you can hand down, so you want to make sure it lasts long enough for the next generation to get some good use from it. 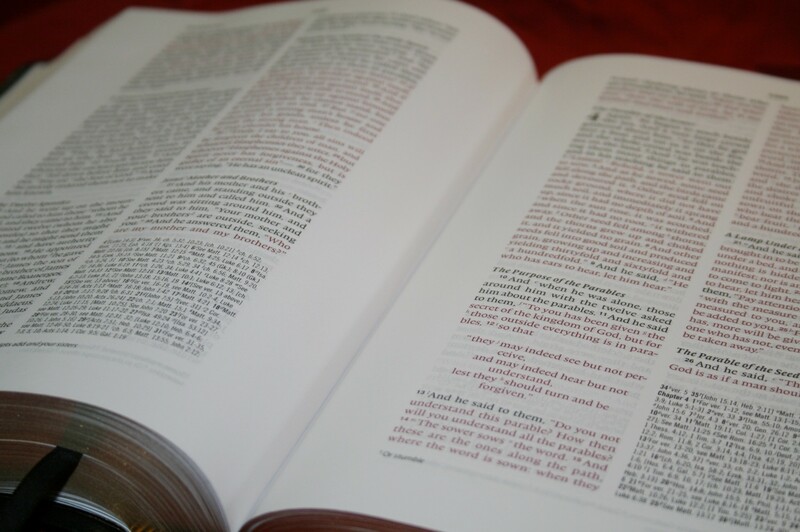 Paper in most wide margin Bibles is much thicker and more opaque than standard Bibles. 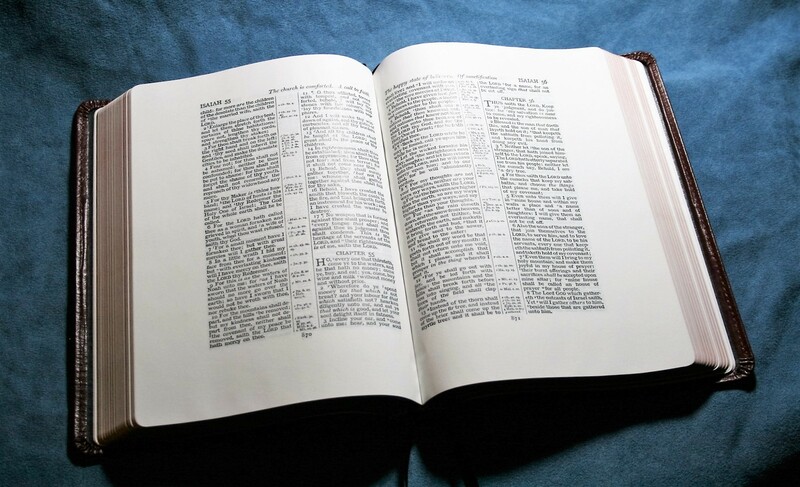 Once you read a Bible printed on 38gsm paper it’s hard to be satisfied with anything else. For your very first attempt you might consider getting something less expensive. It’s much easier to write in a wide margin Bible for your first try if it costs $30 or less instead of $100 or more. What about digital? You could just write your notes into your Bible on your mobile phone, tablet, or desktop. I like these and recommend doing this, however, sometimes it’s best to turn off the gadgets and distractions and interact with God’s Word with paper and pen. There’s something special about a Bible that someone has written in. This can be used when the batteries are low and can be handed down. There’s also something to be said about writing with pen vs. typing (or copy and paste). Writing with your own hand in a small space forces you to think more about the note you’re writing. Of course you could also add your notes to a digital Bible. There are advantages in doing both. It doesn’t have to be an either/or. I like writing notes in an app and then transferring them when I’m confident that I’ve said it the way I want to. 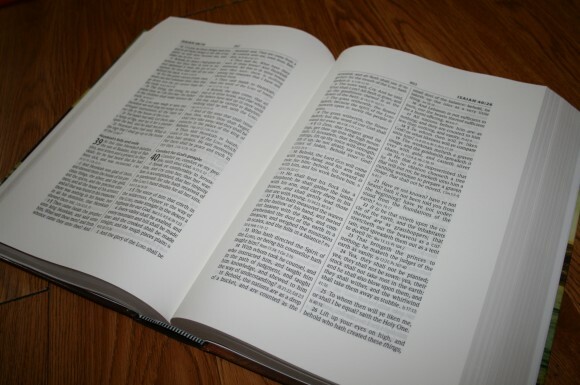 Here’s a quick survey of popular wide margin Bibles and a few alternatives that I recommend. There are more than what’s on this list, but I’m only including Bible’s that I’ve actually seen in person. I’ve separated them into two categories: with references and without references. This is not an exhaustive list. I know of several that I didn’t include. If you have one to add please tell us about it in the comments. These have cross references in either a center column or at the end of verses. Many also include translator’s footnotes (which I believe should be included as part of the translation). Cambridge is arguably the king of wide margin Bibles. Several publishers offer wide margin editions, but Cambridge is the only publisher that offers them in all the major translations. They even match the pagination of smaller editions, so you can have a wide margin and carry size combo in every major translation in many binding options. Brilliant. They have 38gsm paper, inner and outer margins, center-column references, index to notes, ruled pages, concordance, and maps with an index. The Concord is verse-by-verse black-letter while the others are paragraph with section headings and black or red-letter. The Concord includes a glossary. The fonts are just under 8 point. One great advantage of the Cambridge line is they have lots of extra paper in the back for notes. They have blank pages with a letter (Index to Notes, where you can write the subject and reference, definitions, etc. The KJV has one letter per page, the other translations have two letters per page) and 64 lined pages (counting both sides of the 32 sheets). Another advantage is they match either the Pitt Minion or the Concord, so you can carry a smaller edition that matches page for page to the Bible that you write your notes in. I love every Cambridge wide margin Bible that I’ve seen. My personal preference is the Concord (and not for the reason you think). 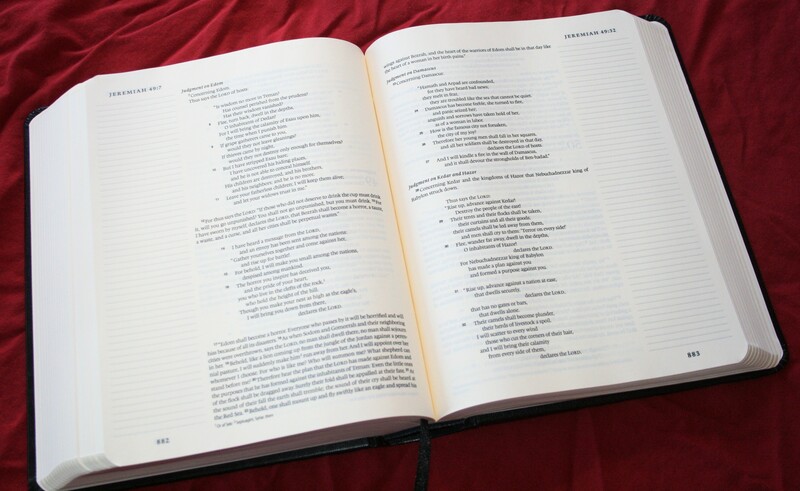 It has a wider inner margin than the others, more pages in the back for notes, a bolder font that’s easier to read, and it matches the regular Concord and Personal Size Concord – giving me more editions to use that match my wide margin Bible. With the good study tools already here, the Cambridge line gives you a great starting point. I consider Cambridge to be the standard in wide margin Bibles, and they set the bar high. They’re available in hard cover (except for the Concord), bonded leather (ESV), paste-down calf split, or edge-lined goatskin. They have 2 ribbons. The overall size = 7.75 x 9.6 x 1.6 (KJV), and around 7.75 x 9.6 x 1.4 (the rest). It’s available in ESV, KJV, NKJV, NASB, and NIV. You can see the reviews here: ESV, NKJV, and KJV. It’s available in several cover options including paste-down TruTone, genuine leather, top-grain leather, and edge-lined goatskin. You can see the review here: ESV. Hendrickson’s Large Print Wide Margin is the wide margin version of their personal size large print Bible. It has 1” margins, an 11-point font, red-letter, and section headings. References are placed at the end of each verse. The paper is thick and opaque. It’s excellent for writing. The helps in the back are lists of Scriptures within several topics including key promises, harmony of the Gospels, miracles of the Old Testament, parables of the Old Testament, miracles of the New Testament, parables of the New Testament, and Old Testament prophecies of the Passion. The helps are great for topical studies and sermon prep. The overall size is 10.2 x 7.3 x 1.8. It’s available in hard cover, paste-down imitation leather, bonded leather, and genuine leather. You can see the review here: KJV. The NASB Side Column Reference from Lockman is a black-letter large print (10-point font) single-column edition with side-column references followed by a 1” margin on the outside. The text is set in verse-by-verse format with poetry set in stanzas. The paper isn’t as opaque as a Cambridge, but the format is hard to beat. It has 95,000 cross references, section headings, an 82-page concordance/dictionary combo, book introductions, and 8 full-color maps. This is one of my favorite NASB’s on the market. I recommend it even if you don’t plan to write in it. The overall size is 9.75 x 7 x 1.5. It’s available in imitation leather, genuine leather, and calf skin. Here’s the review: NASB. The Minister’s Bible from Holman has different layouts and margins depending on which edition you get. 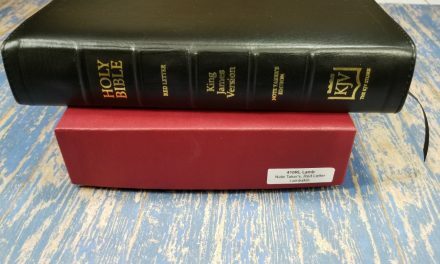 The HCSB is single-column paragraph with a 1” margin on the outside, and the KJV is double-column verse-by-verse with .5” for the inner margin and 1” for the outer margins. The paper isn’t the best I’ve seen in a wide margin Bible, but it’s not that bad. It’s thinner than most, but not too thin to be useful and it does help keep the overall thickness down. 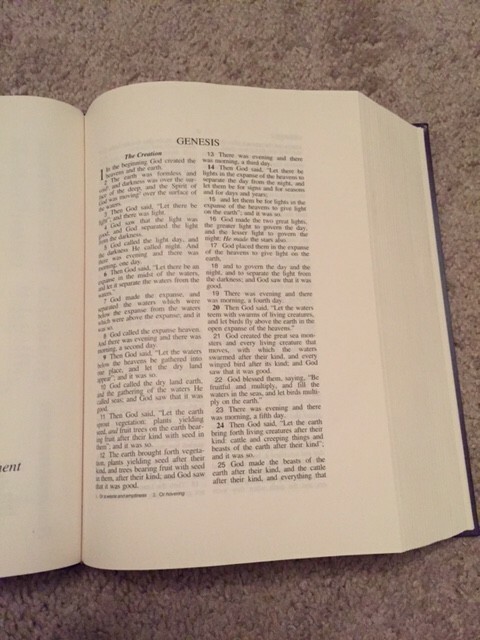 The KJV is the same setting as the Personal Size Large Print. Both editions contain a simple concordance. What they do have in common is the minister’s helps in the back. There are articles include lists of miracles, parables, etc. They also include helps for funerals, weddings, counseling, pastoral care, and more. The overall size is 9.75″ X 6.50″ X 1.25″. 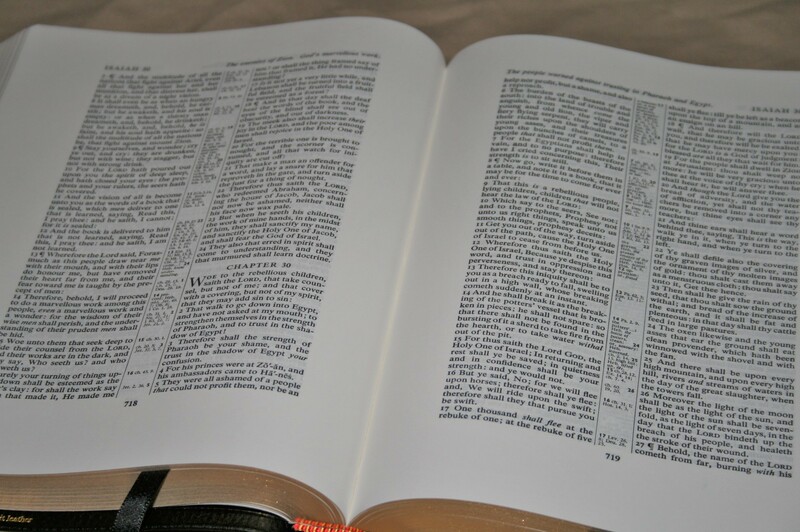 It’s available in paste-down imitation, genuine, and edge-lined calfskin leather, and in HCSB, KJV translations. Here are the reviews: HCSB, KJV. This is LCBP’s reproduction of the Cambridge Cameo wide margin. It’s a double-column verse-by-verse format with an 8-point Medieval Petite Clarendon font. It includes the Translator’s to the Reader, the old 152-page Cambridge concordance and 8 old Cambridge maps. It has center-column references and a wide margin on the outside and in the footer. It includes 2 ribbons. The paper is 36gsm and white, but can sometimes have a glare if the light hits it right. This is usually not a problem though and might not even be noticeable. The Signature Series has art-gilt edging. It’s available in both black letter and red letter. There are two models available: 110: has 1” margin on the outside, and 120: has 1.5” outside margin. Both have a 1.25” footer that works great for the inner column notes. 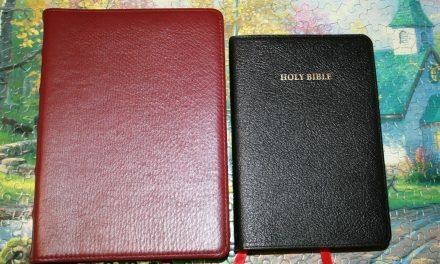 They’re hand-sized editions (110 = 6 x 8.75 x 1.25, 120 = 6.5 x 9 x 1.25) and are easier to carry and handle than many other wide margin Bibles on this list. Another advantage of this one is it is a Cameo, which LCBP also publishes as the 115. You can use the 110 or 120 for notes and carry the 115 or Cameo to have a perfect match. The 110 and the 120 are available in cowhide and ironed calfskin in black, burgundy, or tan (110 only). I’ll be reviewing the 120 soon. The New Inductive Study Bible is a single-column reference edition that was designed specifically for the Inductive Bible study method. It includes a guide for Inductive study. It includes pages for notes for each book that asks questions. It has maps and drawings in the 1.25” margins to help you get started. The paper is slightly cream and thicker than the average study Bible. There are 14 pages in the back for notes. The font is black letter and around 10-point and semi-bold. There are no section headings. Instead, there is a place for you to add your own chapter titles. It includes a helps section, 70-page concordance, 8 pages of maps, and lots more. With its way of leading you through making notes I think it would be a good starter Bible. The overall size is 9.25 x 6.5 x 2.1. It’s available in hard cover, imitation leather, and genuine leather. 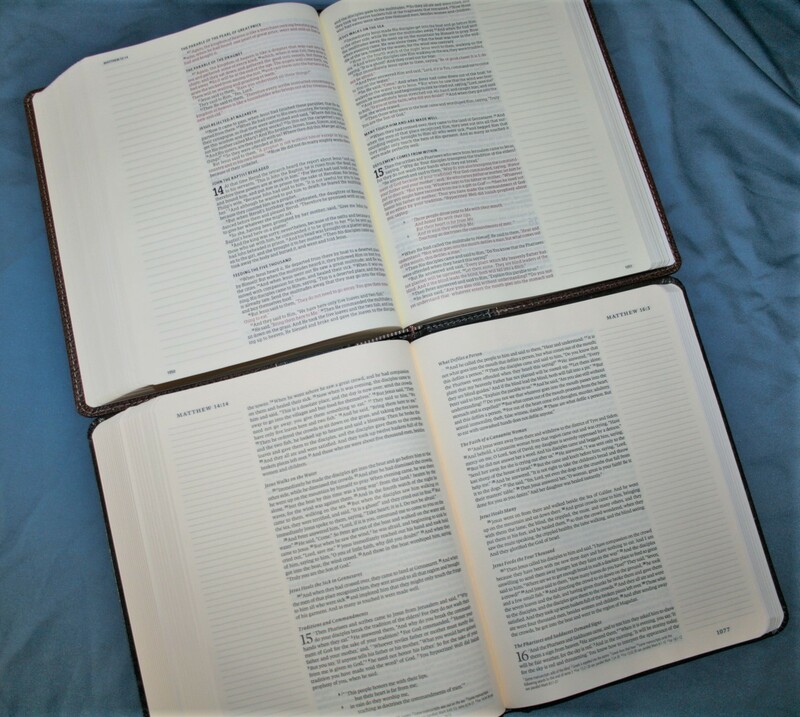 These Bibles might have footnotes, section headings, or nothing but the text. Single Column Journaling editions have one column of text and a wide margin that’s around 2” with lines to write on. The fonts are 7.5 bold and is presented in paragraph format (except KJV, which was an unfortunate missed opportunity to create the prettiest KJV. It does have more writing room per verse at least) with section headings. The paper is a dark cream. The size is easy to carry and use. This is the most popular Bible for art journaling. It’s currently available in several covers from Crossway in ESV, bonded over board from Holman in KJV, NKJC, HCSB, and soon will be available from Zondervan in NIV, and Tyndale is creating their own in NLT. The overall size = 8.25 x 6.5 x 1.5. Crossway’s Single Column Legacy was designed after the renaissance concepts of the perfect page. It’s a single-column setting in paragraph format with section headings placed in the margins. The rest of the 1” margin is useful for your own notes. Footnotes are placed in the footer. It has white 36gsm paper that’s great for writing and highlighting. It has a 9-point font with 10.75 leading, so it’s great for reading and there’s plenty enough space between the lines for underlining. The Heirloom edition has edge-lined goatskin in black or brown and has 4 ribbons. The paper is 28gsm which makes this edition thinner than the regular edition. It’s a beautiful Bible but it’s not the one I would choose for making notes in the margins. The overall size of the standard edition is 9 x 6 x 1.5, and the Heirloom is 9.5 x 6.5 x 1.25. It’s available in hard cover, TruTone, genuine leather, and goatskin. Here are the reviews: TruTone, Heirloom Edition. The Note Takers (which is LCBP’s own design rather than a reprint like the 110/120) is an amazing wide margin KJV. It has a large 11.5-point black-letter dark font presented in a single column verse-by-verse format and a 2.5” outer margin. It comes with two ribbons and has a 197-page concordance and 8 old Cambridge maps. The paper is 36gsm. There are 18 pages in the back for notes. If you want a text-only KJV with plenty of note space and large print, this Bible is the one you want. I highly recommend the Note Takers. If you need a large print you can’t go wrong with this one. The overall size is 9.75 x 6.75 x 1.75. 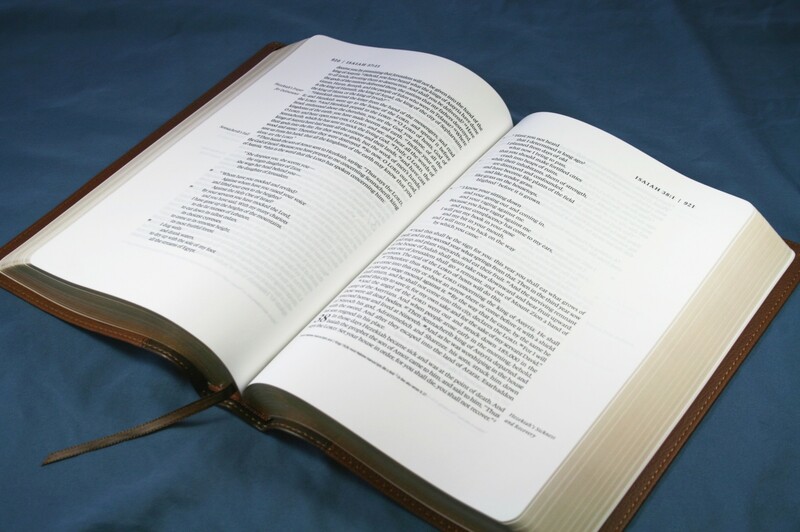 The InTouch is an NASB in double-column, verse-by-verse format with a 1” margin on the outside and in the footer. Footnotes are in the footer just under the text. It has a 10-point font that’s consistently dark. Section headings and verses that start a new paragraph are bolder to help them stand out. The paper is bright white, thick, and very opaque. It includes a concordance and maps. The overall size is 9.5 x 6.75 x 1.5. The Note-Taker’s from Zondervan is a series of Bibles available in several translations (the features vary depending on the translation). It has a double-column format with ~1.25” margins on the outside and in the footer. Some are in paragraph and others are in verse-by-verse format. The fonts are a medium dark 8/9. Some are black letter and some are red-letter. They have section headings. Most have footnotes in the footer. For some reason they decided to remove them from the KJV. The paper is very thick and opaque, which is perfect for writing. Some have a concordance and some do not. This is not a good choice if you intend on taking lots of notes as the space is small for the number of verses on the page. The overall size is around 9.5 x 6.5 x 1.2. The KJV Journaling Bible from Barbour has the thickest paper I’ve ever seen in a Bible. At 60gsm it is also the most opaque paper I’ve ever seen in a Bible. It’s very easy to turn pages. It has a double-column verse-by-verse format with a 2.5” wide margin on the outside that has 2” ruled lines. The font is an 8-point which feels small for this size of a Bible. This means there are a lot of verses on each page that have to share the space in the margin, so I don’t recommend it if you want to take a lot of notes. The font is red-letter with about a medium darkness for both black and red. It has section headings within the text. In the back are a few helps including book summaries, key characters, important women, key stories and events, overview, and passages for times of personal need. The overall size is 5 x 7 x 1.75. It’s available in imitation or bonded leather. You can see the review here: KJV. 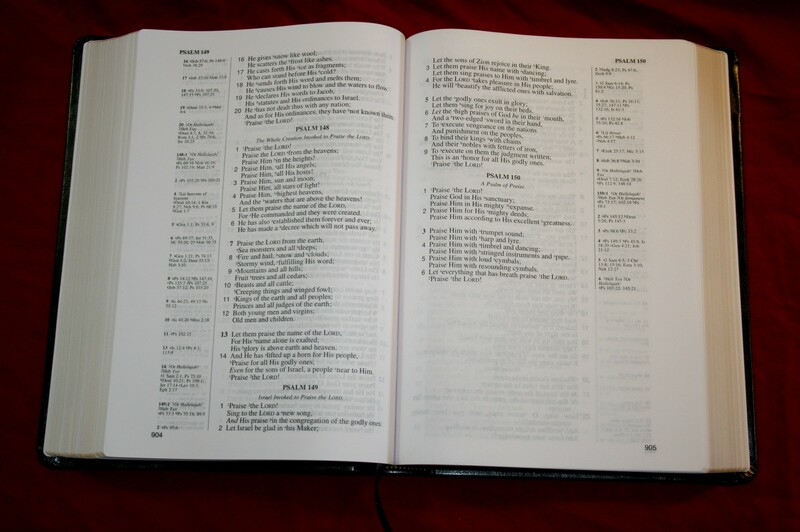 Anchor’s interleaf KJV, as the name implies, has a blank page between every page of Bible text. It’s a text-only edition with an 8-point black-letter font. The paper is thin and not as opaque as I’d like, but it would be too large if the paper were thicker. This is a favorite among preachers and teachers as the over 700 full blank pages have enough room for sermon outlines, illustrations, and classroom lesson outlines. The overall size is 5.5 x 8.3 x 2. It’s available in genuine leather. I plan to review this one sometime in the future. An alternative to writing in your Bible is to write in a journal. It’s difficult to get a journal large enough to hold a Bible’s worth of notes. That’s where the JOT Bible Life Notes comes in. 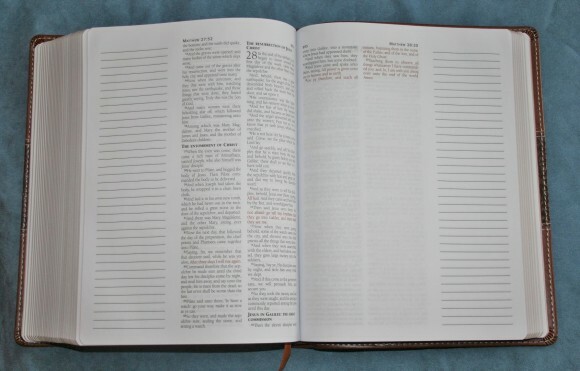 It’s a journal that has note-space for every verse of the Bible. It has 2 ruled lines for every verse of the Bible. The paper is 42gsm. It’s the size of a study Bible and it’s all blank, so there’s plenty of space for notes. It includes 3 ribbons. If you want a journal with enough space for all of your notes you can’t find a better journal than this one. The overall size is 6.8 x 9.8 x 2. There’s no Bible better than the one you’ve poured your heart, soul, and time into. There’s no study Bible prettier than one in your own handwriting (and that’s true even if you don’t like your hand writing). I think that not judging it by its appearance but by what’s on the inside applies. It isn’t how pretty your hand-writing is… it’s how much your notes can mean to you (and others). Here are a few tips to help you get started. Write succinctly. You have limited room, so don’t try to write complex quotes or thoughts. Just write what is necessary to get the point across. If you have paper in the back, write a short note and the page number for the expanded note. If you write an extensive note somewhere, refer to that note rather than writing it over and over again. Write as if you’re writing for someone else to read it. Practice first. 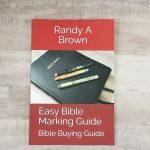 You could print out a few Bible pages and develop your own marking techniques and figure out what you like and what you want to include. Write your notes in a notebook, and then once you’re satisfied with the note transfer it into your margins. You could also start with a less expensive Bible before moving on to a better one. Be sure to look at the whole context of the passage and not a single verse or portion of a verse (I know you know this, but a reminder doesn’t hurt). Keep your system simple. If you get too complex it will be too difficult to implement and it won’t get done (you can guess how I know). It could also be too difficult to refer back to or use. It doesn’t have to be perfect. Don’t beat yourself up for missing a verse in your chain reference or spelling something wrong. Use white-out where you can, erase it if you can, make a correction if it’s needed, and move on. I know ‘someone’ (I’m not saying that it’s me, but I won’t deny it either) that misspelled Jesus in the notes. But you know what? That’s life. I would rather make a spelling error than not write anything because I’m too worried about making spelling errors. You’ll end up with a study Bible that answers the really hard questions. That’s something most study Bibles don’t do. You’ll also have answers from your own study rather than someone else’s. It will give you the answers that you need, the lists that you use, and the insights that you’ve gathered. It will be yours… made specifically for you. Looking through the Bible of someone that has gone on and seeing their hand-written notes is precious. It’s a true legacy and that’s what I want to leave behind… my own personal study Bible. So, what happens when you get your wide margin Bible filled up with notes and there’s no room for more? That’s easy…. Buy another one and do it again! 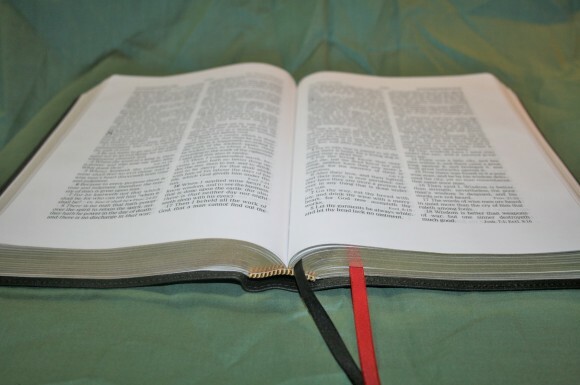 Do you use a wide margin Bible? Do you have something to add? Let us know in the comments below! Very informative, and very well written! I truly love your love for the Word, and it always shows in everything that you write. Thanks Paul! That means a lot! 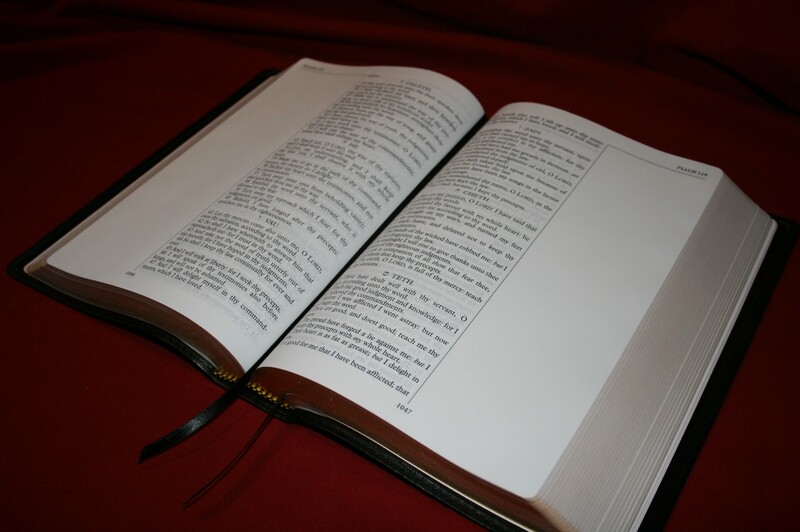 I love using my New Inductive Bible Study but I’m wondering if its also available in calf or goat skin cover. I don’t think it’s available in calf or goatskin. That would be nice. You could have it rebound. This is the finest article on wide margin Bibles I have ever read! Thank you for being so thorough and clear. Thanks Tom! I’ve been reading larger print too. The paper and print in many wide margin editions are so much better that I can read them without any trouble. The Nelson does sound like a good one. If I come across one I’ll let you know. It’s a good idea to contact the publishers. If there’s enough demand they could bring it back. I will contact them too. It’s amazing what you can find in second hand stores. Did you have the Thumb Index done after market in the top picture? If so what company did you use? Hi Jared. It is aftermarket but it came to me that way, so unfortunately I don’t who did it. It’s not done well. I think someone did it themselves rather than taking it to a pro. I really like my Common Man’s Reference Bible. Nice wide margins, and the paper seems to take high-lighting & written notes very well. (of course, the lambskin cover is a plus too!). I am a 22-year old who is looking for a high-quality, leather-bound Bible that will follow me for a long time. I currently use a Newberry KJV Reference Bible, but I’d like to update to an NKJV. I would like wide margins to write notes in, preferably in a single-column, paragraph format. I really appreciate your reviews on here! I was wondering if there was a particular edition you’d recommend. I love the quality and attention to detail in the Schuyler. Just wish they would come out with an edition with wide-margin, single-column formatting. We can’t always get what we want, though, I suppose. I’m curious as to what you would purchase if you were in my shoes. Feel free to recommend something that’s not on this list, as well, if there’s something out there I’ve missed. Hi Daniel. Unfortunately the NKJV doesn’t have a lot of options. You’ve already mentioned the best choices. If I had to choose from this list it would be the Holman for the single column and wide outer margins. However, there are large print editions coming out later this year from various publishers (I’m sure Nelson is printing one). The only other Bible I can think of is the Schuyler Single Column NKJV and it’s hard to find and has small margins. The original Nelson edition is smaller. I’ll keep my ear to the road. Hopefully we’ll see some more single column NKJV’s in wide margin soon. Thanks Randy. I had no idea those options were available. I have always just used a regular Bible and It does get a little tight sometimes! i am just starting out with wide margin type. i need large print , cross references. im open to ESV, NIV, NASB OR EVEN A HCSB. WHAT DO YOU THINK? Hi Michael. The largest print that I’m aware of in those translations is the Crossway Wide Margin (9 point) and the Foundation Side Column Reference (10 point). Great article. Very thorough! 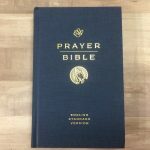 I’m looking for an NIV large print, wide margin, red letter with center column reference and extra paper for notes in the back of Bible. Any suggestions? Thanks Fran! I don’t know of any in large print. I’ll keep on the lookout for one. 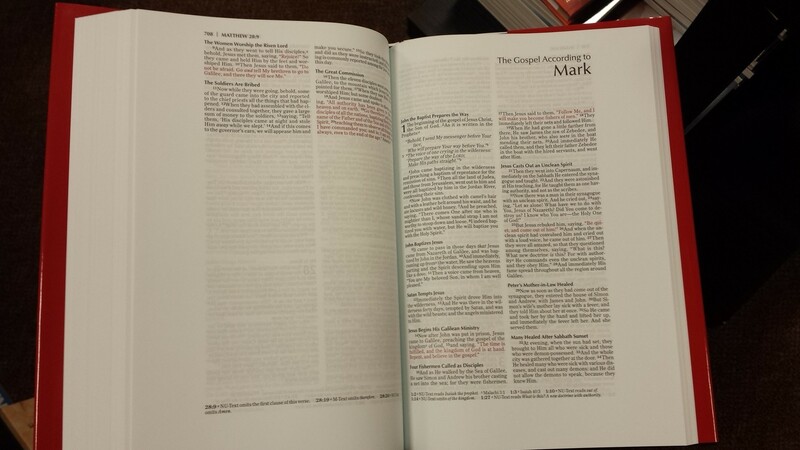 Hi, which has better line-spacing and larger print, the Zondervan NKJV Note-taker or Cambridge NKJV Wide-Margin? Hi Jay. The Note-taker. It has an 8-point vs the 7.9 in the Cambridge (which is hard to notice the difference even side by side), and it has a considerably larger line-spacing. Also, its words are not as close together. The Cambridge font is darker, but the Note-taker font is dark enough. Between the two I’d rather read the Note-taker. Thank you! I’ll get the Note-taker. I have a Cambridge wide-margin Bible, which I really like, but I haven’t figured out the best way to use the note pages in back, especially the lettered pages. Are those intended as indexes to my notes in the margins, or used to compile lists of references on a topic, or as a place to write notes, or all three and more? Any ideas? Also, would you have any tips on creating chain references? I like to have chain references on different topics, i.e. Creation, marriage. How can I differentiate the different chains? Hi Dewey. For the note pages I recommend all three of those ideas. The lettered pages are also good for definitions or word studies (although limited by the space). With the limited space I don’t recommend trying to include every topic – just the topics that are the most important to you and your studies. For chain references I like to use other resources and combine the portions that work for me. 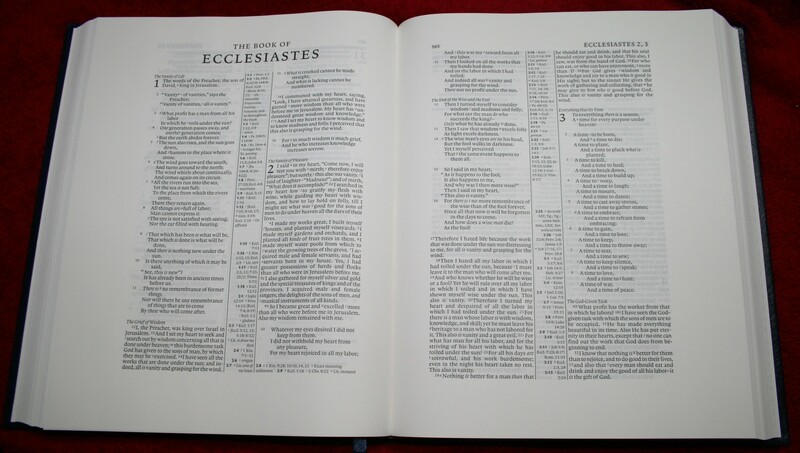 For example, I might combine references from a Thompson, Oxford topical index (found in the Longprimer and Scofield Bibles), Sword Study Bible’s topical chains, Open Bible, Master Study Bible, and regular reference editions like Westminster or other reference Bibles. Just like with topical indexes I recommend adding the references that are the most important to you rather than all of them. Also make a note of connections as you read. Often you’ll find that verses connect that publishers don’t include in their references. For differentiating chains, I prefer to write the topic name if I have room, but if not then I like to use symbols, numbers, or letters. So I am searching for the smallest wide margin KJV that I can find. What is the smallest one that you are aware of? I currently have a 120 LCBP series, but the older style font strains my eyes a bit. The only other editions I can think of are journal Bibles, but they have even smaller print than the 120. If I come across any others I’ll post them here. 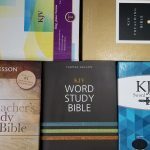 Looking for a journaling bible in NIV or NAS with concordance and references in as readable print as possible but it can’t be too big since my 13 year old will be carrying it back and forth to school. Can you help? Hi Dee. There isn’t one in NASB, but there is one in NIV that has references. It’s the NIV Journal the Word Reference Bible. It’s the standard size for journal editions, but it’s only available in a few colors. I have a Zondervan NASB and a Cambridge Cameo. Something I do that some might find worthwhile is I type out my notes on clear, printable label sheets, and I carefully lay them into the margins. Just use a spreadsheet or word document to create a column the right size so the text you print is formatted to the Bible’s margin size, less a small trim margin of its own to keep it from the Bible text and the edge of the page. I’m looking for a new Bible, because my notes tend to be too extensive for either of the ones I presently have. I stumbled across this page in my search for that new Bible. I’ve been looking at the LCBP Note Taker’s Bible. The only reservation I’ve had is that I’m not sure if I like the cover or not. Other than that, it’s about as perfect as it gets for my personal taste. The margins are huge, which gives me a lot of room for in depth notes and cross-referencing. I wanted KJV, just as a personal preference (it’s what I’ve always used, so I find it most comfortable to read). The text is large, which is important, because my eyes aren’t what they used to be. And most importantly … it doesn’t have someone else’s opinions or superfluous thoughts at the bottom of my pages. It’s pure, unadulterated text. Not footnotes, no references, no nothing. Just readable KJV with a huge margin to put the results of my own research and study. The intent with this one is to use heat transfer to get my notes onto the pages directly, without the use of label sheets. I’m not 100% sure it will work. But if I can get it to work, my printed notes will be neatly printed on the pages without any stickers, labels, etc. I do expect that it will work. For those with OCD issues like me, it’s a great way to get clean, type-written notes into a beautiful Bible. Very useful page. Thanks so much for the time you put into it. Thanks Alex! I am a Note Takers fan. I love your idea! If you do try it please let us know how well it worked.